What does hiking have to do with wellness?? Ever since I was a kid, I trekked into the woods behind our house to explore and be by myself. It was so quiet and comforting among the trees. Through the years my hikes in the forest have helped me heal on many levels. In the silence of nature I heard the answers I was seeking, I understood lessons I needed to learn and how I kept myself a prisoner of my own mind, believing the thoughts I had about myself were true. This kept me in fear which held me back from my dreams and goals. Fear is nothing more than FALSE, EVIDENCE, APPEARING, REAL. My journey’s into the woods helped me to understand this. I’ve come to learn that we are the Architects of our lives. And so, this series of mindful hikes was born out of wanting to share with others the powerful healing qualities nature possesses. So what does Hiking have to do with Wellness? You may be wondering why I offer hiking excursions when I am a bodyworker. What does one have to do with the other? Well, as a massage therapist I manipulate the muscles and fascia on a person to relieve muscular tension and improve circulation that will carry away metabolites. I am helping that person heal on a more physical level. I may use Reiki energy work or essential oils in a session. Watsu is a massage given in a warm pool. These are all elements of nature. Of course the rest they receive during the massage is beneficial for relaxing the mind and massage helps improve body awareness. After a massage the person experiences a kind of euphoria from the improved circulation, release of endorphins and time of rest. This may last for a short duration. Shinrin – Yoku is Japanese for forest bathing. It is actually prescribed in Japan as a form of therapy. Japan has done many studies that prove spending time in nature among trees has a host of healing benefits, such as lowers blood pressure, increases immune function and has anti cancer effects. It was found that the trees emit phytoncides which are an oil that protects the trees. When in the forest this oil is present in the air so is taken in to the body when we inhale. Couple the physical healing qualities of being in a forest setting with mindfully walking through the trees; your heart rate increases improving blood and oxygen flow, so you are breathing in more of this healing oil. Increased heart rate also releases endorphins, the feel good hormone. As you admire nature around you, it takes you out of your thoughts and brings you to where you are in that moment. You experience feelings of peace, calm and joy. You become more aware of yourself. During our hiking excursions we will be doing some meditation and quiet reflecting which will calm our minds. In the quiet of the forest we experience BEING. Focusing on the moment of here and now and with each breath we take in the protective compounds of the trees. In this experience one learns to become aware of their thoughts and can change them. So you see, the forest is actually giving you a massage of sorts. One that is healing on ALL levels. Think of it as a massage for the soul. The Pine Barrens of Southern NJ is my home. Though there is nothing barren about it at all! This area of land is rich in history and has an ecologically sensitive landscape, known for its white sands, tall Pines and Cedars that tower above the winding rivers and bogs. Spend some time here and you’ll feel it has a mystical quality. I have the privilege to explore and hike the scenic trails and kayak the rivers on a regular basis. I have always been an outdoors person, trekking into the woods to clear my head or hear my heart speak. I often dreamed of being an outdoor adventure guide. Then I could be outside all the time. 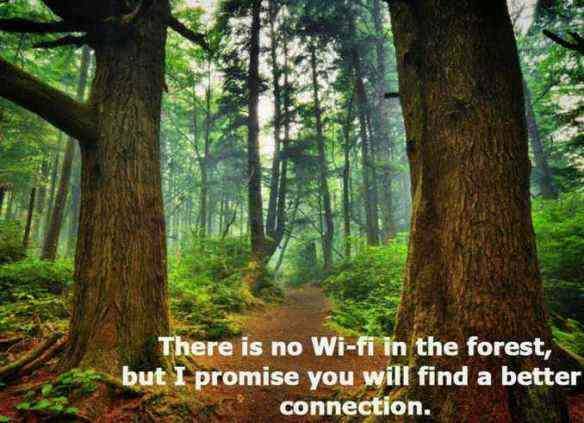 Not long ago it was suggested to me that I offer excursions into the woods to help people reconnect with nature and ultimately themselves. It was such a genius idea! Why hadn’t I ever thought of that? Immediately I planned and prepped for the mindful excursions. I sent out email invites, posted the event on Facebook and told people about it at any opportunity. I wanted to keep the group small to 8 people. I sent out my request to the Universe and WALLAH!! The day of the event arrives and I have 7 ladies! We hiked, meditated, talked and laughed, rested and walked 4.5 miles. A big feat for some of the ladies. As we hiked it occurred to me that hiking through a forest can teach you many life lessons, especially about yourself. How often do we become entangled in the vines of our incessant thoughts? The more we trash to free ourselves, the more entangled we become. It is only when we stop flailing and calm ourselves are we able to find our way out of the tangled mess. Yet, other times we are headed in a direction thinking we are on the right path, ignoring the tiny voice that says otherwise. Then soon realize that wasn’t the direction we were meant to go. Again, when we stop and listen to our inner guidance or intuition it is only then we can make a course correction and get back on the right path of our intended destiny. 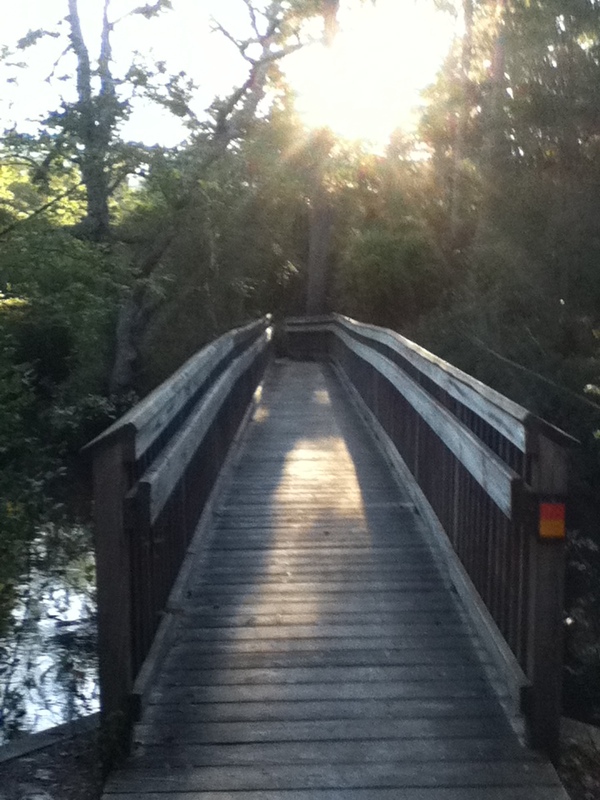 The Pine Barrens is extremely flat terrain with a thick forest of trees and low growing shrubs. There is little to reference your position from, except for the sun and shadows. Once under the tree canopies it is easy to get turned around or lost. Not long ago I was hiking a trail for a short 2-3 miles by myself as I usually do. It’s my quiet reflective time and helps me connect with the Divine. This particular day was cloudy and for some reason decided to make it more of an adventure by going a little off trail and came to a narrow dirt road. I confidently walked believing I was going in the right direction to get back to my car. I walked and walked, then began to get a bit nervous but I kept walking. “I’ll make it back eventually.” I thought to myself. Suddenly I heard a voice in my head, “You are going in the wrong direction.” I kept walking and didn’t pay any attention to it. A short while later, the voice echoed again, “Turn around, this is the wrong way.” “No it’s not!” I shouted out loud. Who was I talking to? I kept walking. Then I began to really question my direction. Was I going the wrong way? I stopped, looked around, and listened. Again the voice commanded, “Please turn around and go the other way!” “FINE!” I called out. “I’m turning around! Happy now?” “Yes” I heard in a less urgent tone. So upon changing my course of direction I found I was indeed headed in the wrong direction. I eventually found a trail, which was not the one I originally started on and realized was quite a distance from the original trail I had detoured from. Was the voice my higher self? Intuition? Guardian Angels? Does it really matter? If I hadn’t heeded the guidance, I would have surely gotten lost. So what is the lesson? Besides the obvious of take a compass and don’t go off trail? Whether on the trail or in daily life we need to pay attention to our inner wisdom. It truly knows the direction we are meant to be going. When you feel lost or your mind is entangled with over thinking. Stop, breathe, quiet yourself and listen not with your ears but with your heart. The voice inside you will guide you peacefully, ALWAYS!